It’s Always A Blast – to Design! Who doesn’t love a warm summer weekend filled with music, food, refreshments and community? We sure do – and we love designing the marketing materials too! This year, our Party In The Park theme was inspired by stage lights and the good ol’ red, white and blue of the upcoming Fourth. Originally, this photo was just blue, but with the magic of photo retouching, we added some dramatic red beams as well to really emphasize the connection to Old Glory. You’ll see this brochure all over the Southland and far beyond, and you’ll see that billboard blinking on 159th Street near 92nd Avenue. The inside of the brochure, mailed to thousands of addresses (yes, we help with that too! ), is very cleanly laid out, so there’s no confusion as to when Bad Medicine or American English take the stage. There are also community exhibitions like local dance schools and martial arts that proud grandparents wouldn’t want to miss. The font is fun, kinda funky, but still very readable. After all, if you can’t figure out when and where the Party is, you can’t get there! We also design and produce the Recreational Program book, with a cover inspired by but not exactly like the Party In The Park brochure. That way, everyone is in the Party mood all season long (and we maintain that developed brand). 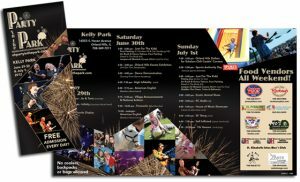 Are you planning on attending Party in The Park? It’s Friday June 27th through Sunday June 29th at Kelly Park in Orland Hills, just east of 92nd Avenue on 167th Street! Do you need marketing materials for an upcoming event, a new product or service? We can help! Just reply to this email or call 708-614-9766. Fireworks, Bands, Food & Summer Fun. All in one brochure. Orland Hills has been using our design services for several years, both for their annual summer fest and their recreation catalogs. This year, Orland Hills named the fest “Party in the Park” and asked for a more mature design, something to attract adults to the bands, the food and the fireworks, while retaining a sense of family fun. We needed to convey a sense of excitement at first glance. We designed the logo, gold on a black background, filled with fireworks and tree canopys, grounded by a line of grass. Then we devised a funky, fun angular theme for the brochure, which walks the reader clearly through the three-day festival and the extensive schedule. Mailing to thousands all over the region, the event was a huge success. I watched the fireworks and enjoyed them immensely!